The Apple iPad doesn't ship with a case of any kind. Apple does sell an iPad case for about $40. Many have reported that the case is very functional as it doubles as a horizontial and vertical stand for the iPad. As with any Apple product, there will be many manufacturers creating both fashionable and functional carrying cases and bags for the iPad. Sprint, of all companies, is on this particular Apple accessory band wagon. Sprint is no stranger to the accessories market. They create accessories for many of the phone devices that they market. It's definitely not like Sprint to market cases for products they don't sell. The case discused here is the 4G Case, and while it is designed to house a Sprint product, it is also designed to hold your iPad as well. The case has a large main compartment to secure an iPad and a smaller front pocket there for the portable Sprint 3G/4G Overdrive WiMAX equipped modem. The Overdrive can connect to Sprint's 3G or 4G network (if you're in range and if you live in one of the limited cities with the service - Detroit is currently not listed). Like one of Sprint's other portable router the MiFi, the Overdrive will allow up to five devices to tap into that network over Wi-Fi. Why is Sprint offering this case? Because some people already have the Overdrive and may get the Apple iPad. The Apple's iPad being sold currently has Wi-Fi only so you can only make the connection when in a Wi-Fi hotspot. Without a device like the Sprint Overdrive (or Mi-Fi), owners of the Wi-Fi only device would be without the Internet when mobile. 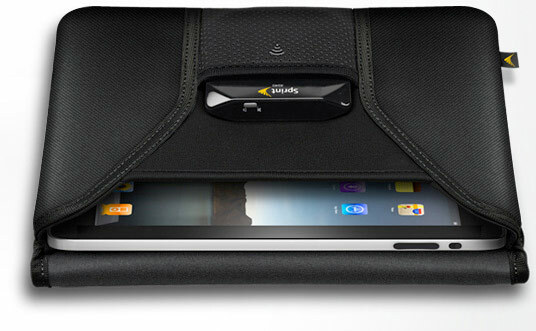 Sprint wants to offer them a 4G iPad (of sorts), and therefore made a case for you to carry around both devices with ease (and style). The case is available from the Best Buy stores. There's no price posted, but it'll probably be between $19.99 and $29.99. The case may not be available at all Best Buy stores so call ahead. Getting an Overdrive will cost you around $59.99 per month, so that 4G iPad won't come cheap. This solution is ideal for those that will need their Internet connection to be shared with other devices like laptops, iPod Touches, and other portable devices. This is the solution I am looking to do as I already have a Sprint USB device for my laptop. I will upgrade to either the Mi-Fi or Overdrive device to allow all my devices to get online. If you will only need Internet on your iPad, then a G3 version of the Apple iPad will be available soon with AT&T service. No contract is required and plans are about $15 or $30 a month without any cancellation fees. This version of the iPad will cost you about $130 more over the same Wi-Fi only Apple iPad. Accelerate at high speed with the first dual-mode shareable device of its kind-available only from Sprint. Now you can extend your 3G and 4G (4G Network available in select cities) experience beyond your laptop to any Wi-Fi-enabled device such as cameras, music players and portable game consoles. And because it supports up to five Wi-Fi-enabled devices, you can share your high-speed connection with friends, family, co-workers and customers. 16 GB of shared storage and no software or activation to fuss with, the Overdrive is a must have for work or play, home or away. Carl W. Brooks is an entrepreneur that specializes in new technology. Mr. Brooks has been an online publisher since 1999 and has numerous sites and blogs that educate everyday people on how to either use, save money on or make money from the technology around us. He enjoys sharing with the world his unique take on technology and how to use it best in your life.